The winter holiday season is upon us. With that comes family gatherings and feasts, along with the indigestion that inevitably follows. Whether eating too much or eating foods we know aren’t healthy for us, this season can take a toll on almost anyone. Digestive health is an issue that affects countless people worldwide. There are many drugs, supplements, and other products marketed at people as being able to improve digestion. One of the easiest ways to prevent digestive problems is by making sure you have a good balance of bacteria in your digestive system. 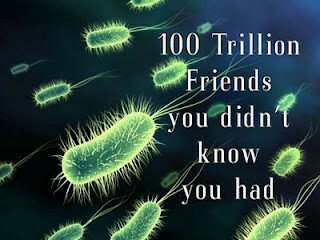 A healthy digestive tract is estimated to have over 100 trillion microorganisms. These microorganisms (including many species of bacteria) break down food and convert it to nutrients we need, but when they’re out of balance, all kinds of health issues can arise. An easy way to help your body through these digestively troubling times is to take a simple supplement called a “Pro-biotic”. In addition, there are “Pre-biotic” supplements and foods. So what are “Pro-biotics” and “Pre-biotics”, and what do they do?